Cats and dogs playing around among themselves is quite common and clearly adorable for many canine and feline lovers. The mischief can almost get serious when it is a predator going after its prey or vice versa with trickery. A video of a duck teasing a tiger at a zoo in the water has gone viral and it is pure entertainment if you like supporting the underdog or duck in this case. 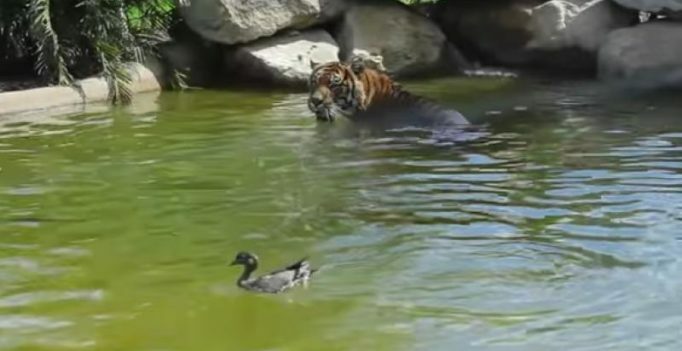 The video which first appeared on Facebook shows Jerry, the duck, braving it against a Sumatran tiger, Jalur, in the pond at the Symbio Wildlife Park in Sydney. The duck decided to give the tiger a tough time in the water but unlike other wildlife videos, the duck proved to be the winner in the situation. The video shows the duck teasing the tiger by appearing and disappearing often in the water and appearing behind the tiger where least expected. The ‘fooling around’ last for almost 10 minutes much to the entertainment of the viewers before the tiger settles on a rock nearby in frustration. While the tiger plays by its instincts, the duck clearly seems to go against its own to tease the tiger to try and catch it and turns out to win the game in the end, much to the amusement of the viewers.